Popular among locals and tourists in search of Asian vegetarian meals, Dok Bua boasts an extensive menu of appetising Thai fare. Recommend dishes include the tangy pla pad pong curry, phad thai, kha moo rom kwuan (a vegetarian twist to the popular flavoured smoked ham dish) and gaeng ped ped yang (roast duck in red curry). Mock meat, made from ingredients such as mushroom, herbs and soybean derivatives are used as a substitute for meat in these dishes. 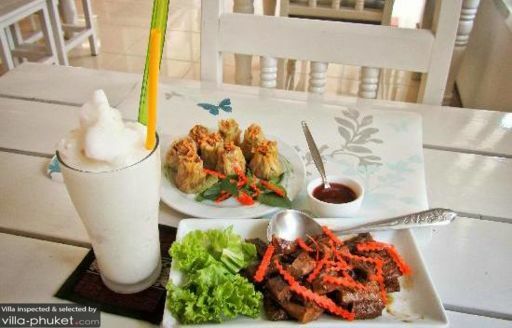 Those who do not fancy mock meat may opt for the light and tasty nam tok hed, a mixed mushroom salad, or makuer yao pad prik horapa, a dish of eggplant cooked with sweet basil and fermented soybean.